Our final release of 2015: Alter Ego #137! Alter Ego #137, our final new release of 2015, hits stores today. And we’re sending the old year out, with a feature-length interview of the one and only Jim Shooter! 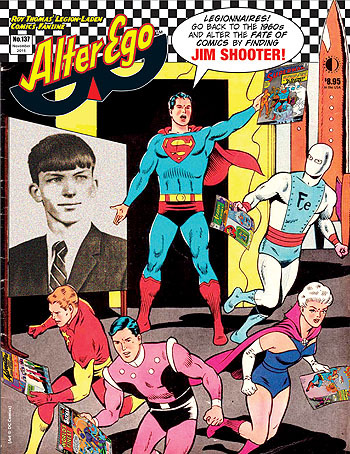 Jim talks all about his 1960s work for DC and Mort Weisinger, plus delves into 1970s and even 1980s work, so don’t miss it! See a free preview and order HERE! And the final, big reveal is in this issue (Part 7). Happy holidays, everyone, and thanks for another great year at TwoMorrows! See you in 2016! This entry was posted in TNT on 23 December 2015 by Mr. Morrow.